Ergo Executive Chair Is A Pneumatically Adjustable, Ergonomically Designed Chair That Provides The Ultimate In Comfort. The Padded And Contoured Seat Slides In And Out From Back Of The Chair From 19" To 22-1/2" Deep. Stylish Mesh Back Tilts And Features An Adjustable Lumbar Support. The Headrest Is Height Adjustable. Executive Chair Also Includes Height-Adjustable, Swiveling Armrests. Functions Include Pneumatic Seat-Height Adjustment, Back-Height Adjustment And Tilt Tension..
Ergo Executive Chair Is A Pneumatically Adjustable, Ergonomically Designed Chair That Provides The Ultimate In Comfort. The Padded And Contoured Seat Slides In And Out From Back Of The Chair From 19" To 22-1/2" Deep. 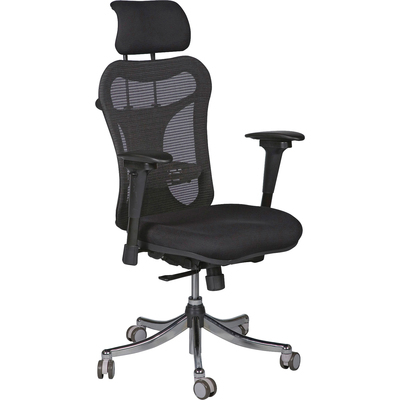 Stylish Mesh Back Tilts And Features An Adjustable Lumbar Support. The Headrest Is Height Adjustable. Executive Chair Also Includes Height-Adjustable, Swiveling Armrests. Functions Include Pneumatic Seat-Height Adjustment, Back-Height Adjustment And Tilt Tension.